Cardigan Bay boasts picturesque seaside towns. 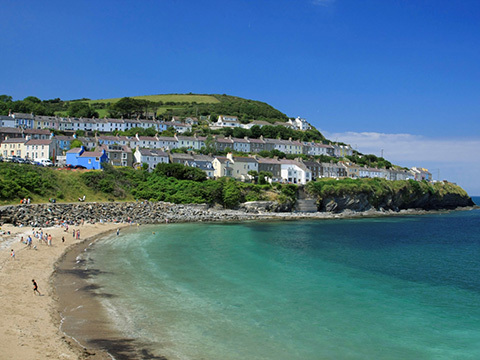 There are a number of towns within easy reach of Brownhill Holiday Park, from the bustling seaside resort of New Quay just 3 miles down the road to the County capital and seat of local Welsh Government, at Aberystwyth. We have provided just a few details here but there is more information available through the Visit Wales website and elsewhere. 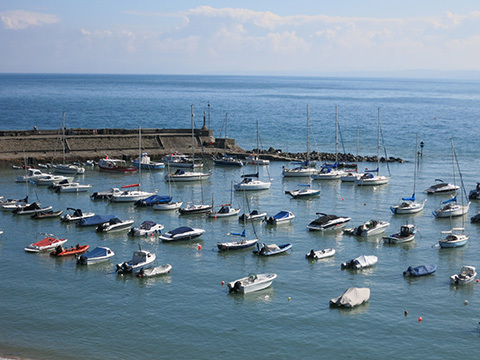 Brownhill is a peaceful caravan park situated close to the scenic West Wales coast and is conveniently located for day trips to Aberdovey and beyond in the north, St Davids to the south and many beautiful bays and beaches in between. The rugged beauty of the Cambrian mountains is also well within range…. 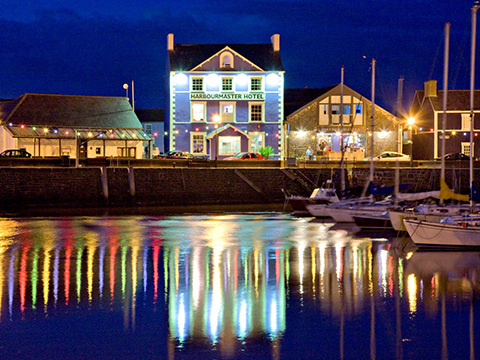 Just three miles away, New Quay justifiably holds a reputation as West Wales, most enchanting holiday resort and has been casting a spell over visitors for many years. 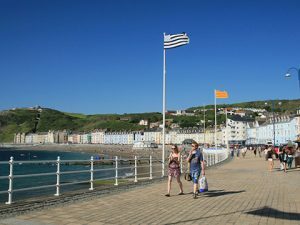 It is also a recognised Blue Flag Beach. There is fresh air, scenery and wonderful wildlife in the bay. 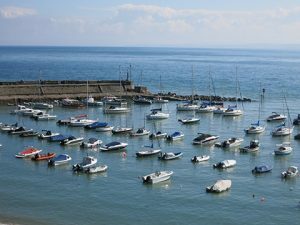 Originally a fishing village, but New Quay also hints of a dark past and is said to have been linked with the smuggling trade in past times. More information on the dolphins is available here. A Georgian coastal town with an eclectic variety of coloured buildings, many of architectural interest, is seven miles away. 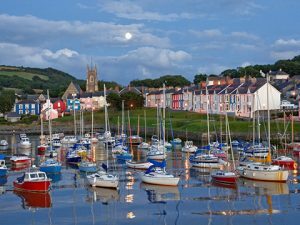 The town really took off in 1807 when the Reverend Alban Thomas Jones Gwynne obtained a private Act of Parliament to build a harbour. 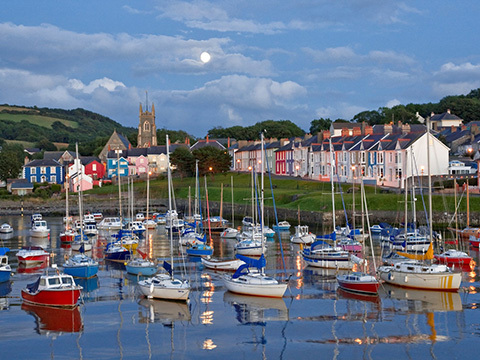 With some fine eating establishments and quirky shops, Aberaeron is a popular town. The harbour also provides a setting for some great holiday photos. Newcastle Emlyn is an attractive, small market town on the side of the Teifi River. Cafés, antique shops and a regular cattle market in the town, bring visitors to the area. You can also explore the ruined 13th century castle set on a high vantage point on a peninsula created by the river. If time and opportunity allow, do visit the wonderful Attic Theatre in the Town Hall buildings and experience some entertaining productions. 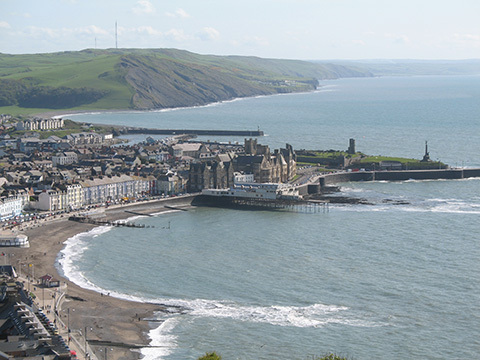 Aberystwyth is the county town of Ceredigion and the home of the National Library of Wales. It is a thriving centre for shopping and the starting point for the narrow gauge Vale of Rheidol Railway. It has been a seaside resort since the late 19th century following the development of the railway line from the Midlands. It has a fine promenade from the castle in the South to Constitution Hill at the North end for some fine views. There is a fine university with an excellent Arts Centre offering theatre, cinema, music and a range of other activities.